Folks, I hate tuna fish, you know they kind that you see in deli counters, saturated with mayo, perhaps some stinky onion, or though celery stalks, and beat into a mushy pulp, perfect food for those who lack teeth. I am a bit spoiled when it comes to tuna fish. My days behind the counter in my uncles store exposed me to Sicilian tuna sold by weight, out of two kilogram tins, preserved in pure Italian olive oil . That food put the bar very high for me when it comes to tuna. My social studies class in Italian middle school taught us about the Tonnara, a quasi mythical event that takes places off the coasts of Sicily, where men wage war on schools - unfortunately not abundant - schools of Mediterranean tuna. 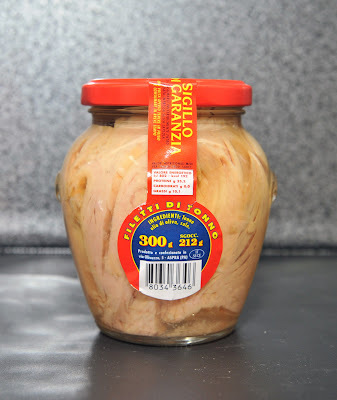 We also learned about the process that takes tuna flesh , and transforms it into great tuna fish in glass jars, some of which is still hand packed today . Here's a quick salad I made by combining Italian ingredients with something quite distant from Sicily . Well, its's a salad not more to say . Just try to keep the tuna pieces from disintegrating and cut your okra in large pieces.